Hi everyone! 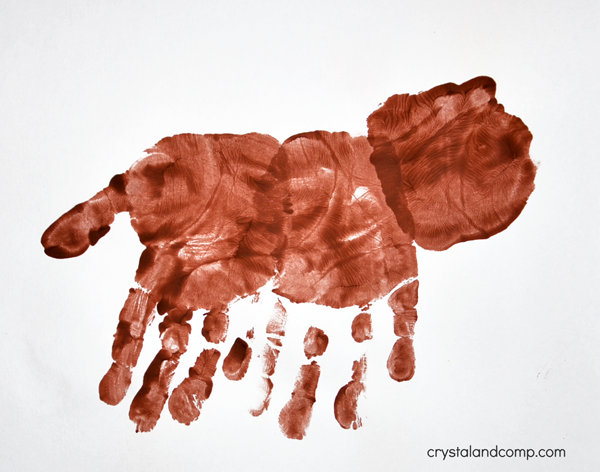 It’s our last week posting over here on Crystal & Co. for the alphabet hand print art series. 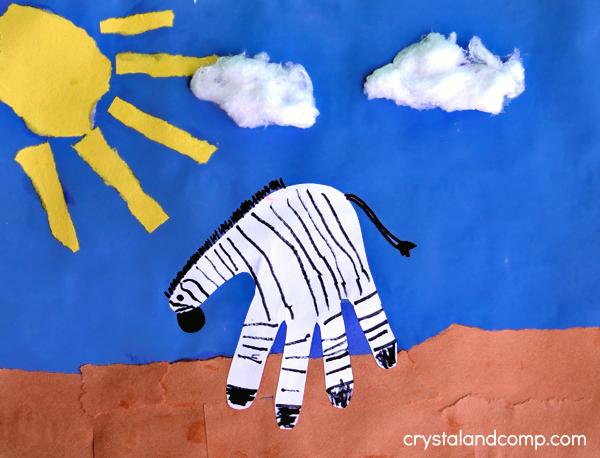 Our last post is ‘Z is for Zebra‘ made with a hand cutout instead of a hand print. 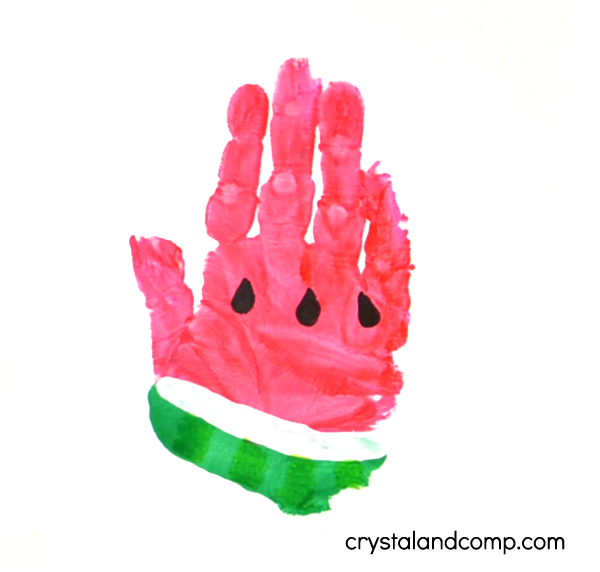 If you’d like to see a painted one, you may like this safari handprint craft we made a few years back. Instead of using our usual white paper for this letter craft, my preschooler and I turned it into a collage art project. We love the look of collages! It’s rather simple to make. Trace the child’s hand on white paper using a pencil. Cut around it. Ask them to draw on zebra stripes, the hooves, and eye. For some extra learning, have them count the stripes as they are drawing them. Take a sheet of brown construction paper and have your preschooler rip a few strips from it. Use a paintbrush to add glue to the strips. The paintbrush is optional and was used to ensure that all the edges stuck down. A glue stick would also work. Stick them along the bottom edge of a blue sheet of construction paper. Glue the zebra on. Make the black hair and a tail using a marker or black paint. Tear a circle shape from yellow and about 5 thin strips. Glue on as a sun. Take a cotton ball and spread it into two sections. Glue these on as clouds. 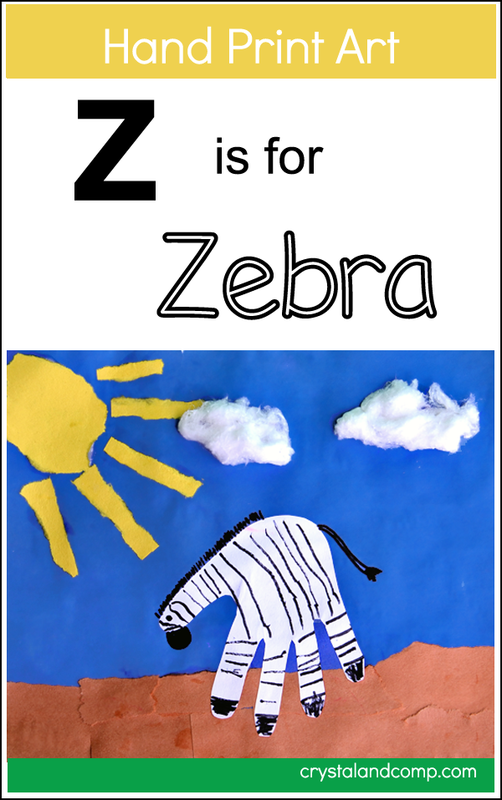 Optional: Write Z is for Zebra. Now you have a really cute collage art project to display on the refrigerator! Now that we’ve finished the entire hand print art for the alphabet series, which one has been your favorite? 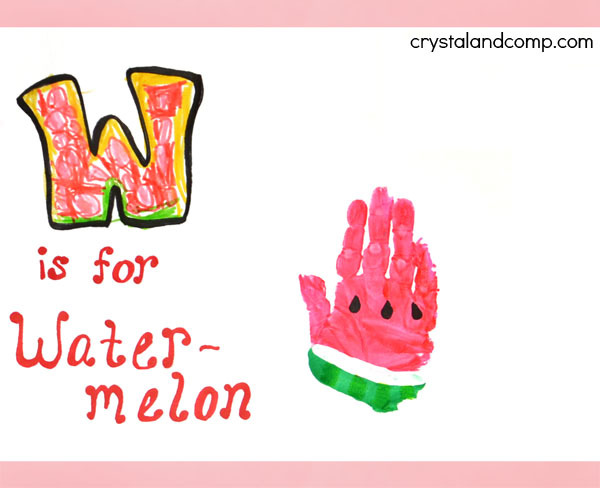 My favorites are the alligator, butterfly, and watermelon. My preschooler’s favorites are the butterfly and dog. You can see them all here. Hope you enjoyed the series and please do stop by our blog to say hi! Hi everyone! 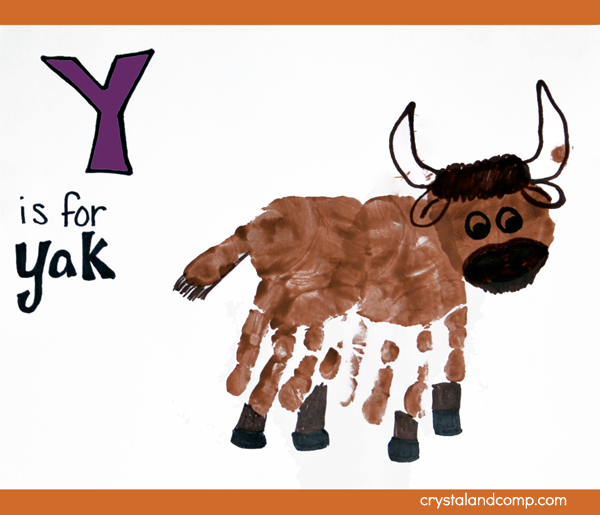 Today’s hand print art alphabet post is a ‘Y is for Yak’ craft. Not sure what a yak is? It’s a herd animal that belongs to the same family as cows, buffalo, and bison. They have long, shaggy hair including a long, bushy tail and horns that are curved. They are usually dark brown to black, but sometimes they can be white and brown. I told my preschooler that it has lots of hair so it can stay warm in the Winter – like a jacket! She learned that they live in the mountains. I also told her that some are ‘workers’ that are often used for carrying heavy things across the mountains. What fun facts do you teach the kids about this large animal? 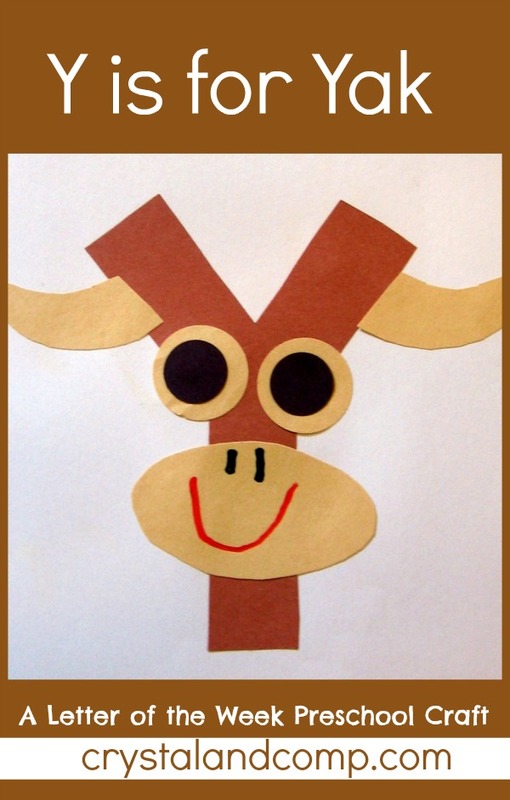 Don’t forget to check the end of the post for even more letter ‘Y’ learning activities for preschoolers! First, have the child paint their hand with either brown or black paint. Make a print on a sheet of construction paper. Repeat with a second handprint placed next to the 1st one. You may omit the thumb or overlap it with the 1st print. The thumb from the first print creates the tail. Turn the page so the fingers are pointed downwards. Make a third print, but with just the palm painted and placed at the top-right of the handprint you made that doesn’t have the thumb showing. Let dry. Draw or paint 4 short legs under the fingers. The fingers represent the shaggy hair. Draw black hooves. Add a fluffy hair-do if you’d like. Draw the curved horns and ears from this. Make the nose area with nostrils and a mouth. 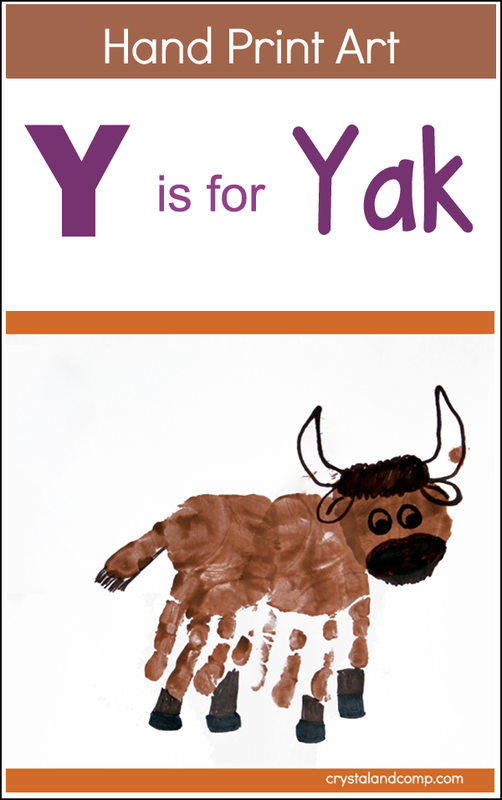 Write ‘Y is for Yak’ next to it. Can you believe there’s only one more post for this series to go after this week?! 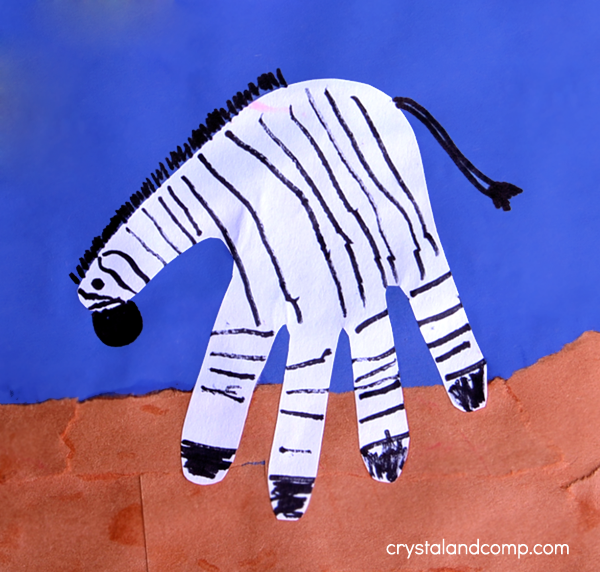 It’s a fun zebra craft so be sure not to miss it! Looking for more things to do as you learn the letter Y? Hi everyone! I’m Amanda from the blogs Fun Handprint Art and Artsy Momma here to share another hand print art for the alphabet post with you all. 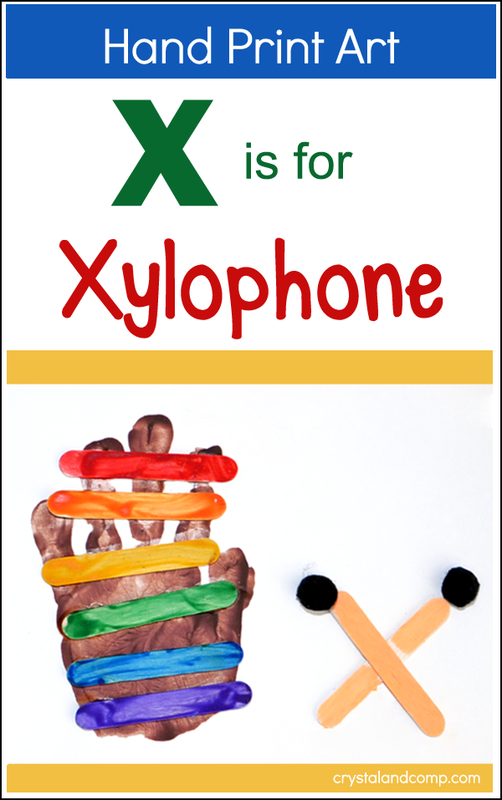 Today we are sharing an ‘X is for Xylophone’ craft. Besides being a fun craft to make for the letter of the week, it will also help your preschooler practice their gluing skills. Show them how to do controlled amounts and ask them to try to make the same size glue dots (or lines). They will also use patterning for the colors of the rainbow which is perfect for those who just learnt the correct order or are in the process of learning it. 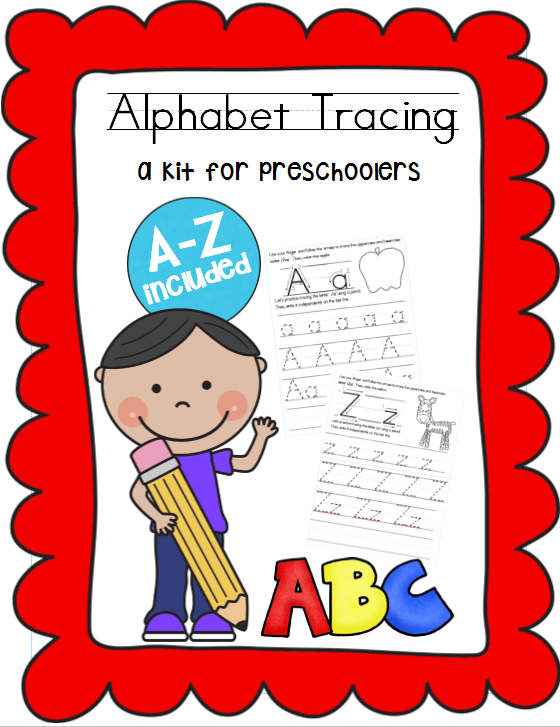 At the end of the post will be even more letter ‘X’ activities to do with your preschooler including books, crafts, and free printables. Start by making a hand print with brown paint. You will want to make sure the fingers aren’t spread too far apart. Set aside to dry. In the meantime, paint 6 mini craft sticks in the colors of the rainbow. Take 2 more craft sticks and let your preschooler design their own xylophone sticks/mallets with markers. My daughter loved that she got to design her sticks as she pleased. 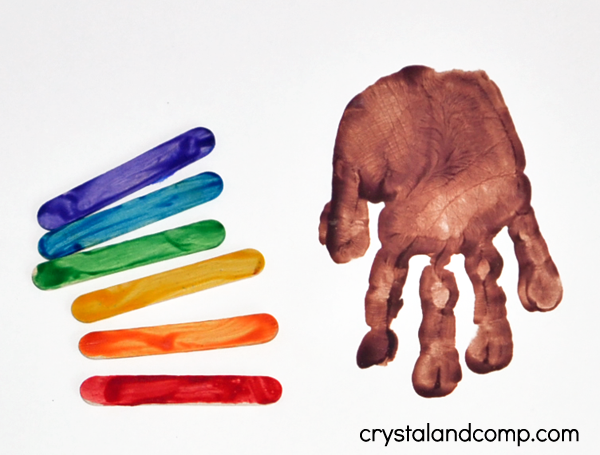 Glue the rainbow pieces on top of the hand print with a little space in between each. 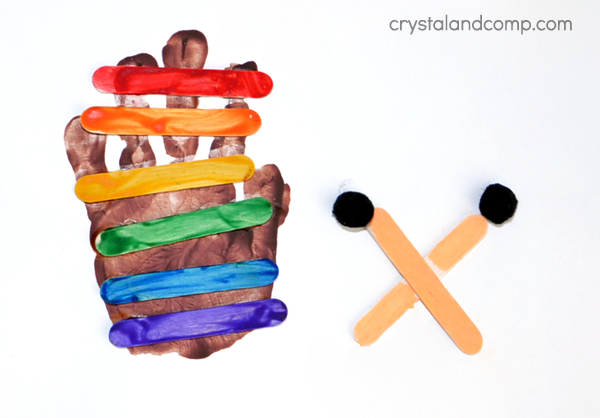 Glue the 2 mallet sticks in an ‘x’ shape next to the xylophone hand print. Add a pom pom t the end of each stick. Remember to ask them to try to make small dots/lines instead of just squeezing out as much as they can. 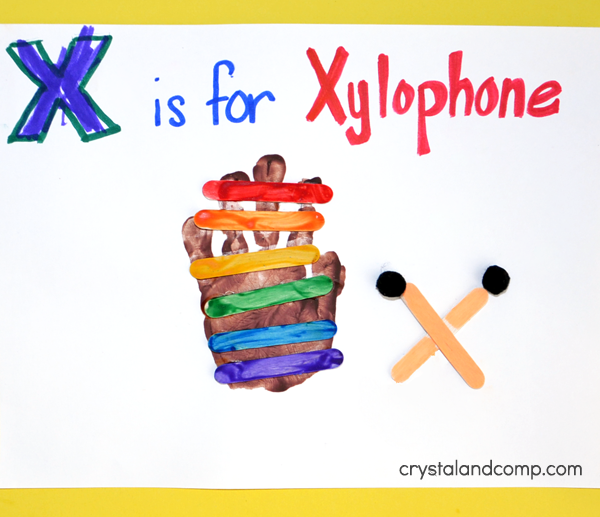 Write ‘X is for Xylophone’ across the top or bottom of the page. Ready for more Letter X Activities?! Looking for a fun craft to make for the letter V? How about a V is for Vase hand print art project?! It’s simple to make and would also make a great Spring Craft or for Mother’s Day. At the end of the post will be even more letter V activities including book suggestions, free printables, and more! 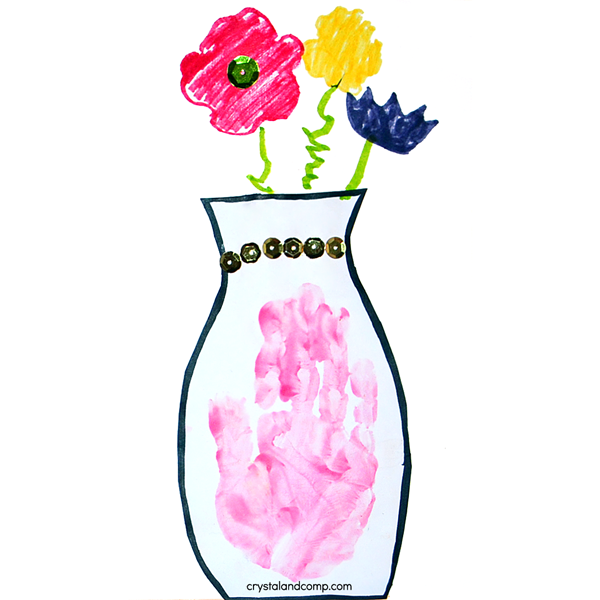 Start by having your preschooler chose a color for their vase and then have them paint their hand. Make a print with the fingers touching each other instead of spread far apart. Draw an outline around the hand print in the shape of a vase. Next is making the flowers which could be done many different ways. My daughter used her flower stencils to color them on. Stickers or fingerprint flowers would also be fun. Don’t forget to draw the stems! Another cute idea would be to make the stems by painting just the four fingers and making prints. Now it’s time to decorate the vase! Our’s has sequins on it. Here are a few other ideas for decorating: use glitter glue, stamps, fingerprints, stickers, buttons, marker designs, and so on. 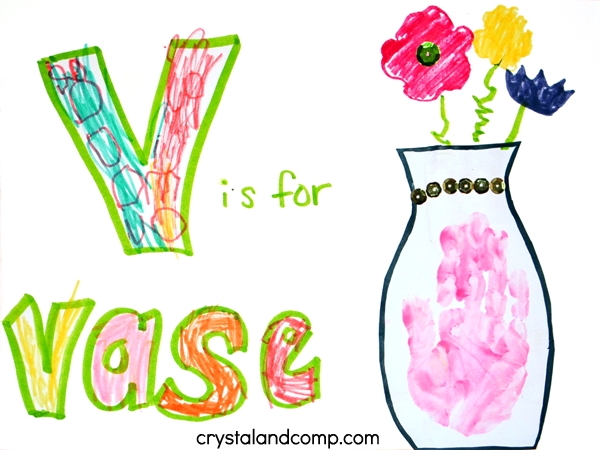 Write ‘V is for Vase’ next to it. 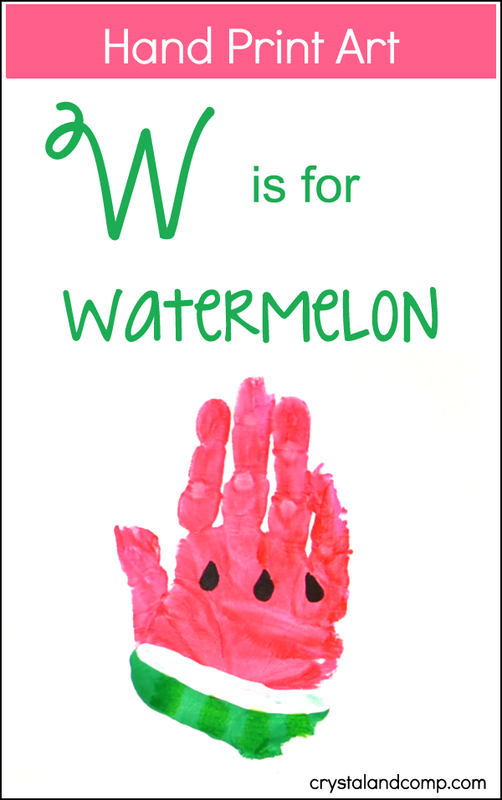 What would you make for the letter V that incorporates a hand print? My son would love making a volcano! A vulture is another idea. 4 more hand print alphabet posts left! Which one has been your favorite so far? I’d love to hear in the comments! Can you believe there’s only 5 more hand print art for the alphabet posts left after today? It seems like we just started! Have you been enjoying it so far? We sure have! 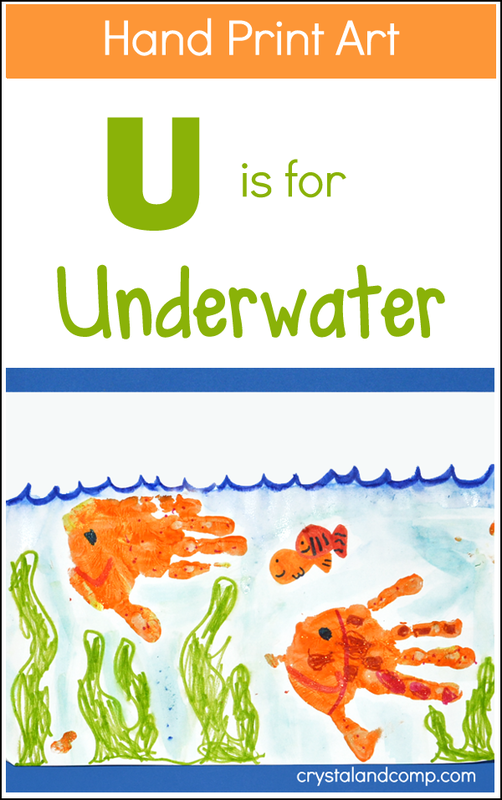 Today we are covering the letter U is for Underwater. Ask your preschooler what they might find underwater. Fish of course! 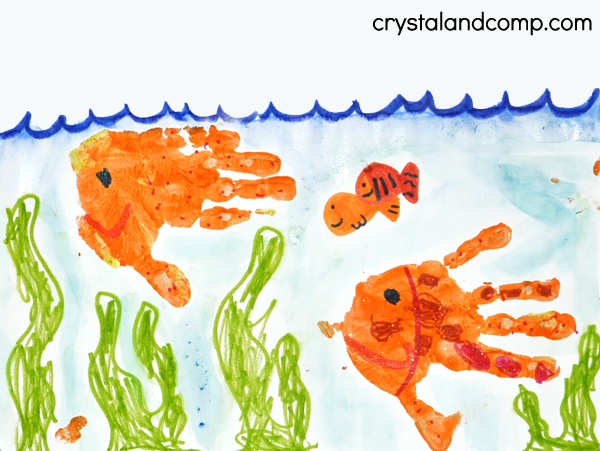 We made fish from my daughter’s hand and drew an underwater scene. We also talked about what else we would find. Her answers were: penguins, whale, seaweed, jellyfish, octopus, and a crab. 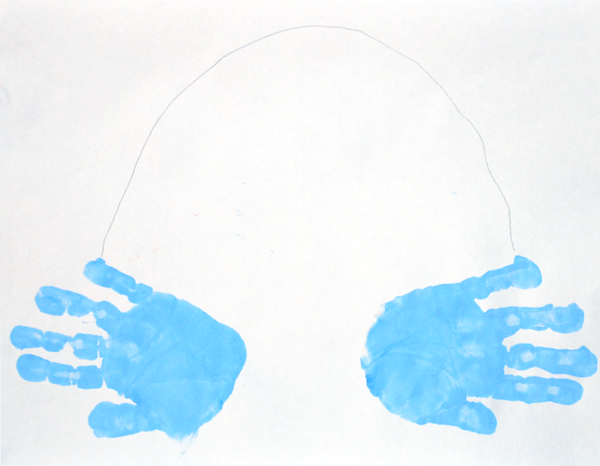 Make 1-2 sideways hand prints on a sheet of construction paper. Let dry. Add a face, mouth, and designs on the fish. You may even wish to draw in a couple other fish or even use thumbprints to make some. 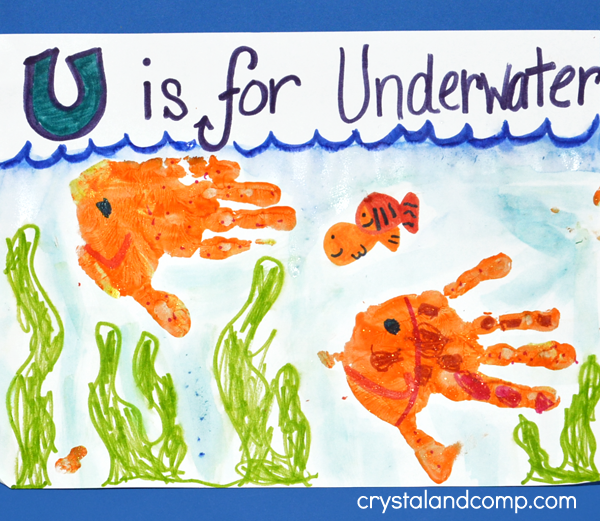 Write ‘U is for Underwater’ across the top. Make a wavy line across the entire page under the writing. Draw seaweed. Let the child color the seaweed. Slightly older preschoolers may wish to draw their own seaweed. Add any other ‘underwater’ things – optional. Use a blue marker or watercolor paint to color the remaining white areas. Talk to your preschooler about how the fish breathe underwater. My daughter’s reply. “I don’t know” with a big smile. Then she tried to find out from Big Brother. Here’s a cute video on YouTube explaining it in a preschool-friendly way. 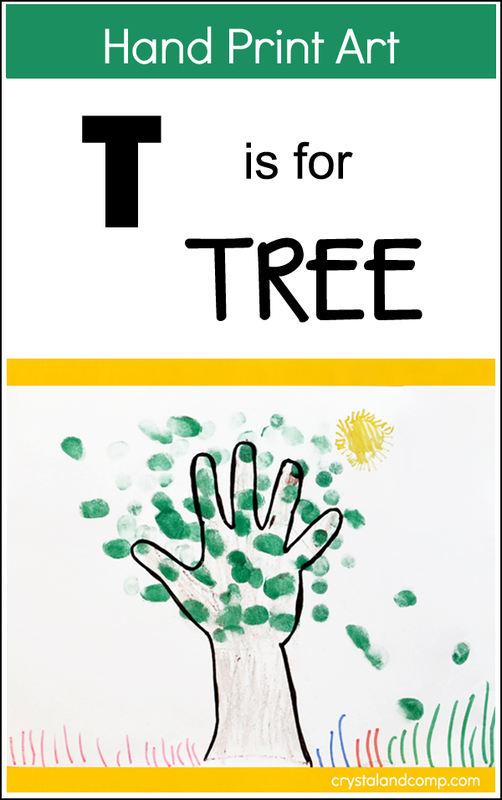 Today’s hand print art is a craft to go along with the T is for Tree letter of the week theme. In the past, we have made all different kinds of hand print trees – apple, cherry blossom, Fall, Winter, Valentines-inspired, and so on. We’ve made them from paint, traced and cut from brown construction paper, traced and colored, decorated with homemade puffy paint, stickers, tissue paper, stamped…. the ideas are endless! 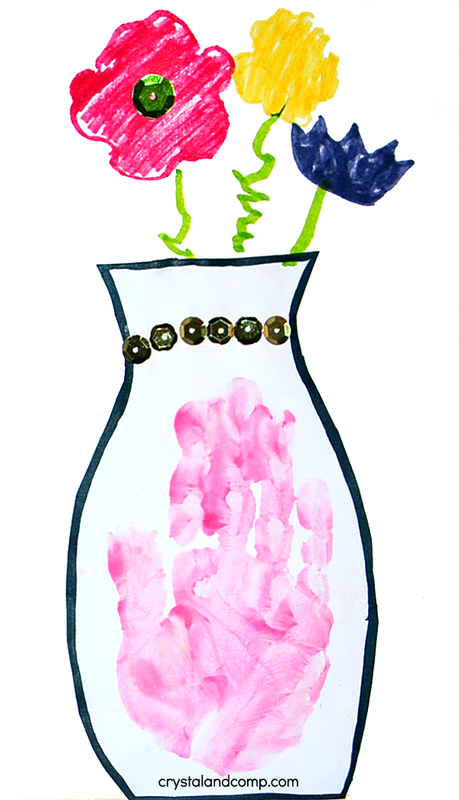 You can easily incorporate different preschool skills into this art activity. Have them count either while making them fingerprint leaves or count how many afterwards. Have them cut or tear pieces of paper instead of making fingerprints. This would also be a great way to have them practice making small drops of glue for the leaves. For our craft today, we chose to make a simple traced hand tree with fingerprint counting. I let my daughter decide how she wanted to finish decorating her artwork. 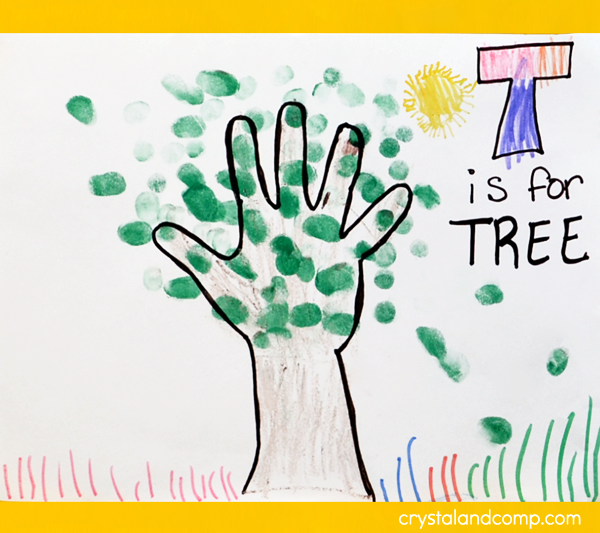 Trace the child’s hand and part of the arm to create the tree trunk. We used a brown marker for tracing. Color the inside of the tree truck. My daughter used a brown crayon for this part. 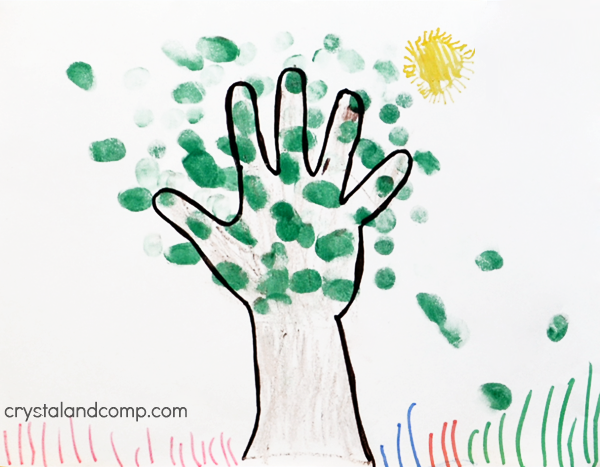 Ask the child to make green thumbprints or fingerprints using the green ink pad or paint so that they go over the top of the hand as well as around it. Optional: My preschooler loves to draw suns on all her artwork and this time she wanted rainbow grass – too cute! Write ‘T is for Tree’ across the top. 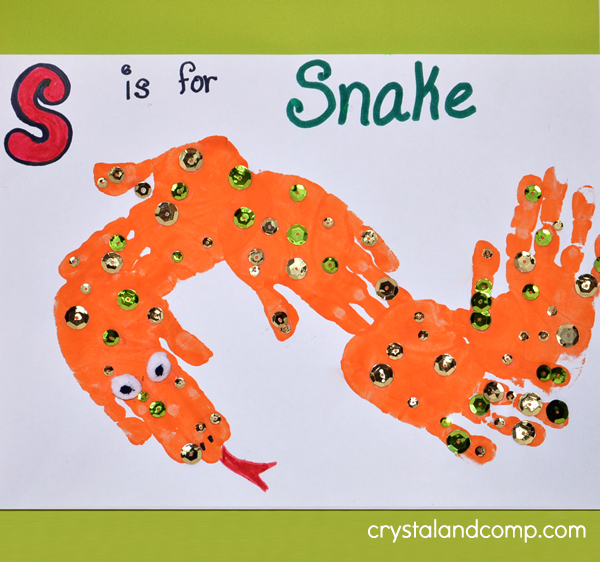 Incase you missed it, last week’s hand print alphabet craft was a snake! Looking for more ideas for a letter T learning theme? Looking for a fun craft to go with the letter S? 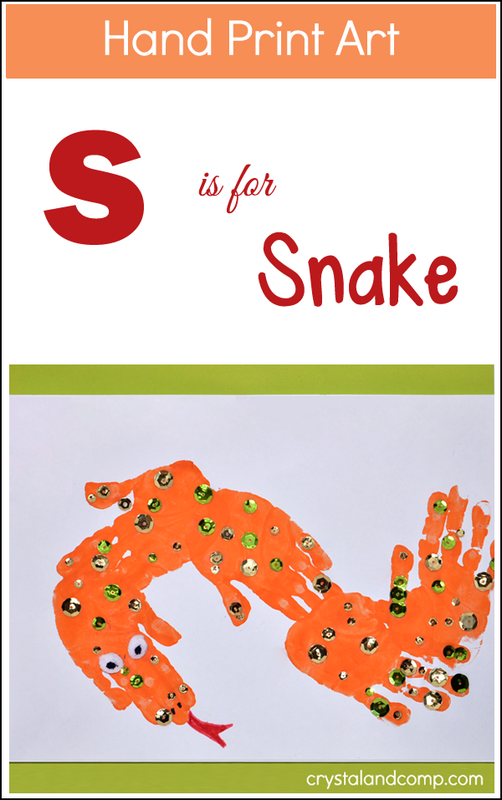 How about an S is for Snake hand print art craft?! 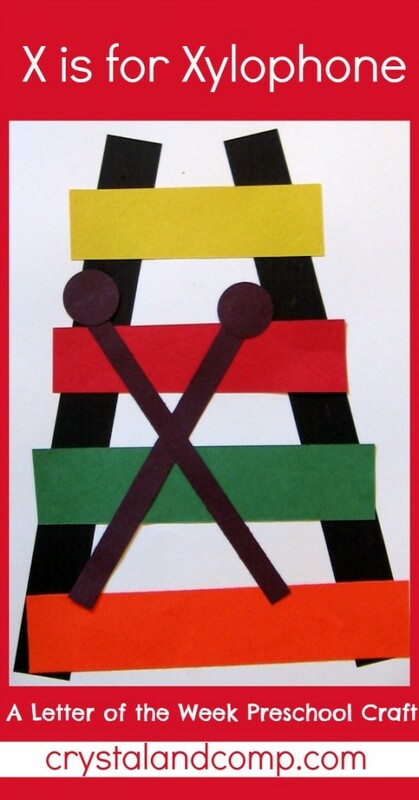 You may also like this letter of the week snake craft to make along with this one. Plus, at the end of the post there will be a snack suggestion, free printables, book suggestions, and more. 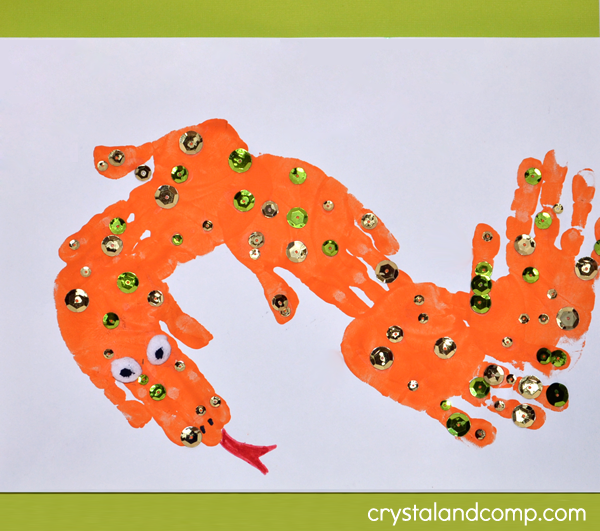 My preschooler loved making this snake craft! Besides learning about the letter S, it also gives them practice with gluing and the added sequins give them fine motor practice. She tends to squeeze way too much out so I let her know before making the glue dots to try to make them the same size as the sequins or smaller. Start by having the child paint their hands orange. My daughter painted her left hand and then rubbed the two together. Make 5+ handprint in a curvy snake shape. The handprints should all be touching each other. Let dry. Glue on 2 small, white pom poms for the eyes (or googly eyes). Add black dots to centers. Have the child make dots of glue all over the snakes body, as many as they’d like. Add sequins to the glue dots. We used green and gold in 3 different sizes. Instead of add sequins, you could add buttons or gems. Fingerprints would also be fun! Draw on a tongue with red marker. Write “S is for Snake” across the top. 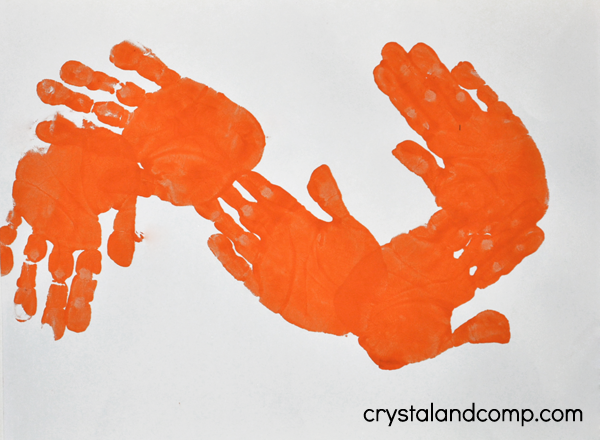 Looking for more activities to go with your hand print art? Check out all of our letter of the week activities for kids below! We’re back with another hand print art for the alphabet post! Our last post was a quilt for the letter Q. 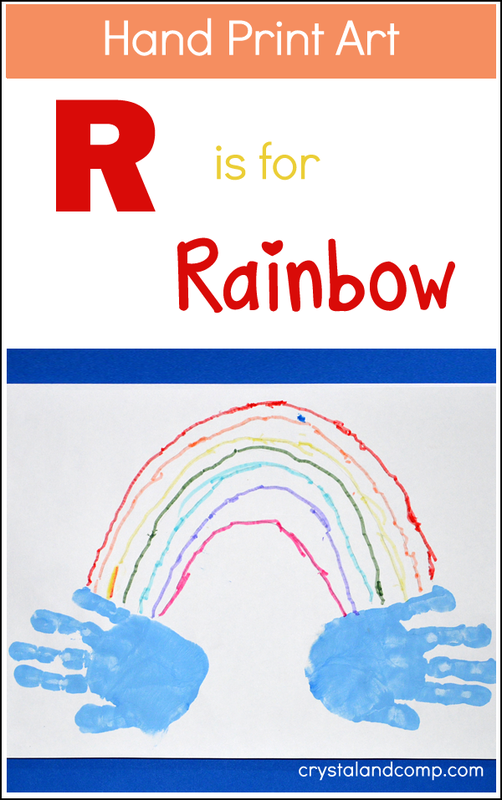 This week, we are sharing R is for Rainbow. Besides a letter of the week theme, it’s a great way to brighten the dreary Winter months with color. The hand print rainbow also fits into a Spring unit, St Patrick’s Day theme, and for preschoolers to learn their colors. 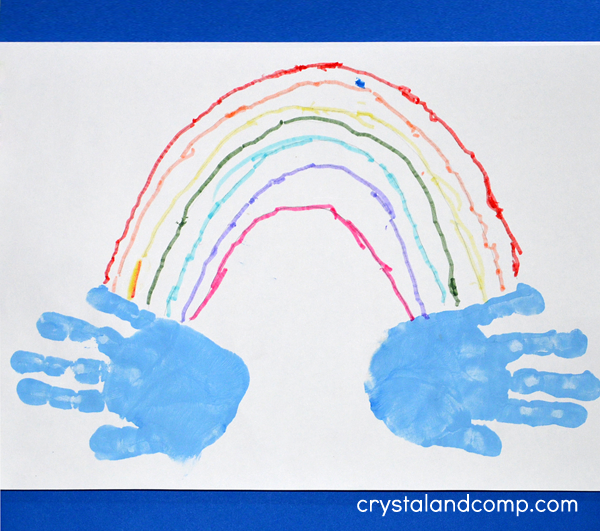 Over the years, we have made hand print and fingerprint rainbows many different ways. You could make a print in all the different colors (so six hand prints total), paint stripes on the hand or foot, or even paint each finger and the palm area one of the six rainbow colors. Don’t forget, at the end of the post will be more letter R activities including crafts, worksheets, and book suggestions! Start by having the child paint their hands a gray or light blue color. Ask them to rub their hands together so both are completely covered on the palm side. Make the right hand print on the left side – this way the thumb is on the bottom of your cloud instead of the top. Make the left hand print on the right side. My daughter likes to draw rainbows with straight lines when she is doing open-ended activities, for this rainbow I wanted her to try to draw a curved lines. I used a pencil to draw the rainbow’s arch. She traced over it with her red marker. I wanted her to draw the rest of the colors by herself but she insisted that I draw the lines in pencil first. When she had finished with the red, she was super excited about it (tracing carefully) exclaiming, “I did it!” I’m thinking that’s why she wanted all of them drawn in pencil first. She also insisted that her rainbow have pink in it so she snuck it on when I wasn’t looking… tee, hee! Variations: Instead of drawing lines, they could paint them or use fingerprints. When my son was younger, I made him a colored line template for him to make his fingerprints on. 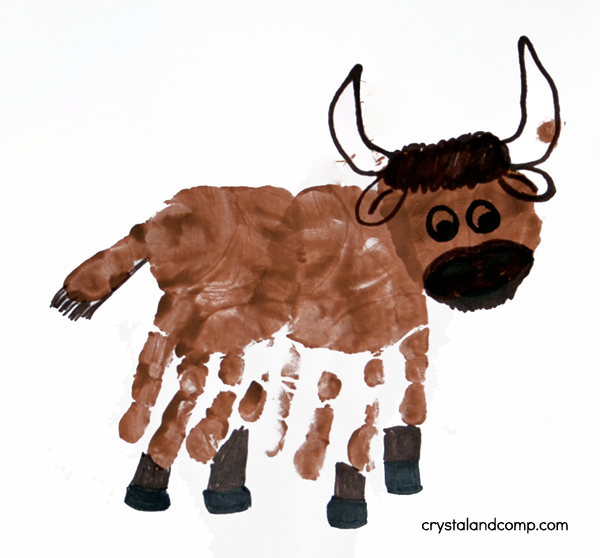 See you next week for a hand print animal craft that begins with the letter S! Today’s handprint art for the alphabet is actually a fingerprint and thumbprint craft. 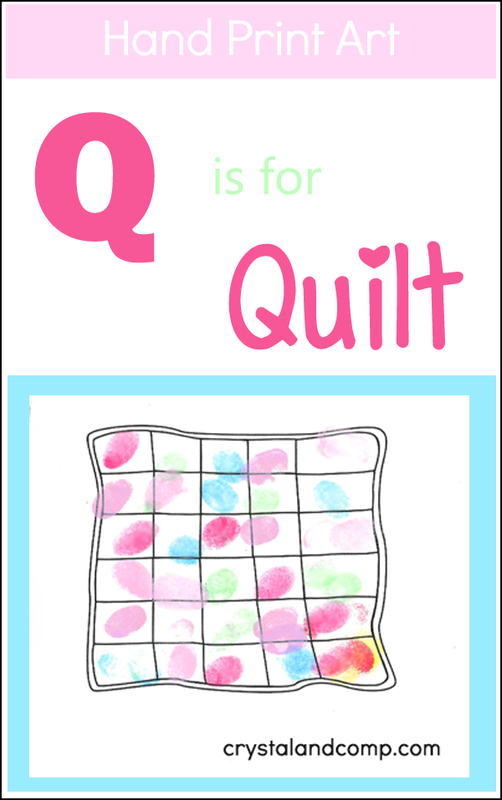 The letter theme we are sharing today is Q is for Quilt. Originally I was going to have my preschoolers use handprint to make this craft until I saw a really simple (and free!) quilt template and knew she would love to fill in the little squares. At the end of the post there will also be more activities to go along with the letter Q including do-a-dot printables, a quilt craft, and book suggestions. Print the quilt template (see supplies list). Set out ink in various colors or use paints. Have the child make fingerprints and thumbprints inside each of the quilt squares. 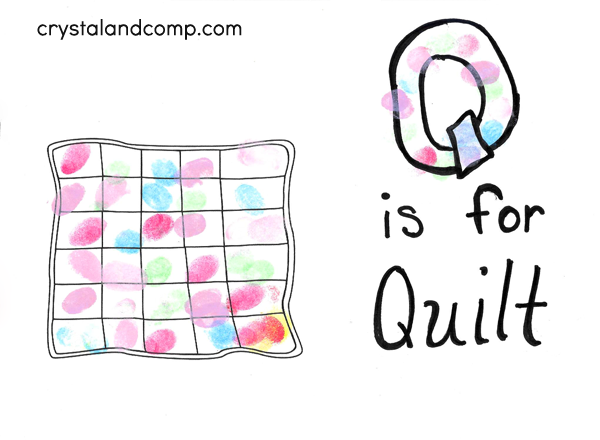 Write ‘Q is for Quilt’ next to it. We made the ‘Q’ a bubble letter so my daughter could make fingerprints inside it. Would you make something different for this letter? My son always chooses quail while my daughter would choose queen. Neither one of them knew what a quilt was before this! Up next is a rainbow!